To Dog With Love: Win a Trip To BarkWorld Expo! Win a Trip To BarkWorld Expo! Join us at BarkWorld Expo, where your dog gets a seat at the table too! Here's your chance to win a trip to BarkWorld Expo, thanks to Pruven from 3M, the brand that brings you all sorts of useful products for pet care! 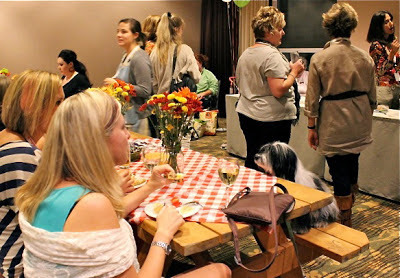 We've been to every BarkWorld since the pet social media conference began in 2010. Since it's right here in our hometown of Atlanta every year, it's super easy for us to attend, but we would happily travel cross country to attend BarkWorld. BarkWorld offers pet lovers of all kinds (not just dogs, but cats and ferrets and maybe even capybaras, too!) the chance to network and learn about a whole assortment of pet lifestyle and social media topics. Enter the contest here by July 12. BarkWorld 2013 is August 22-24 in Atlanta. Hope to see you here! And if you come in early, let me know and we can take the pups for an Atlanta adventure! I would love to win this...Thinking about my video now...Thanks for sharing! This would be pawsome to win! Thanks for spreading the news. I don't need to win, but we will see you there! Good luck everyone. Have a marvellous Monday. How fantastic! I am already going to BarkWorld and cannot wait to meet everybody!